The Spring 2018 Bridal Fashion Week is behind us, leaving us with new trends, details and embellishments. We are excited to see that some designers pushed the limit while others stayed classic for the less daring bride. This season we couldn’t help but notice that some of the Spring wedding dress trends started with the letter ‘C’ – Capes, Casual and a hint of Color! Now we remember last Fall, the trends were a high-neck, off the shoulder and ruffles. And not all trends last. But this season we expect to see them cary into the Fall. The Elie Saab cape is floor length and adorned with floral detail. Eliza Jane Howell went a far different route with an elbow length fringe cape. 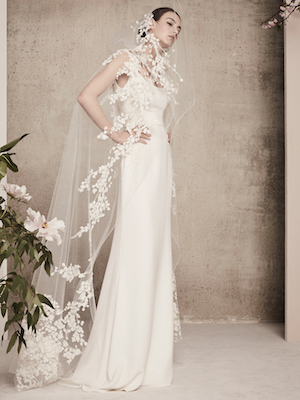 Lastly, Romona Keveza stayed with an elegant fabric which reaches the floor, attached at the shoulder with a bow. Daughters of Simone are known for their bohemian wedding dresses, always with a comfortable cut and lots of lace. Carol Hannah designed a goddess draped spaghetti strap dress with a daring low cut in the front. 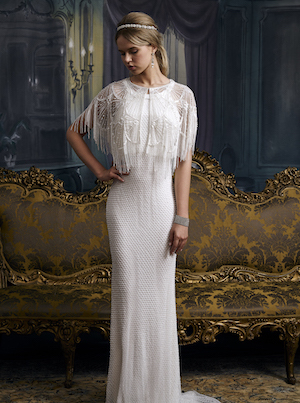 BHLDN specializes in casual wedding dresses with a hint of detail for the every day bride. 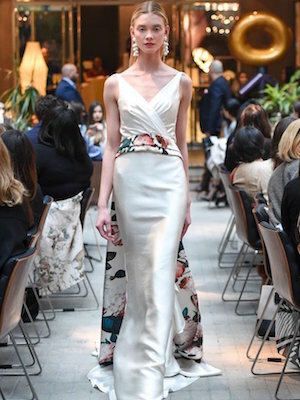 While black was a trending color for Spring 2018 wedding dresses, we love these dresses that have just a hint of color. 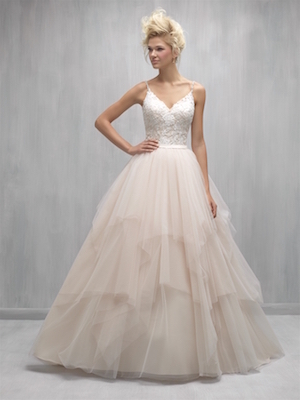 Madison James designed a tiered tulle ball gown with a hint of pink. Sachi and Babi set themselves apart with pairing a white wedding dress with a floral sash. And lastly, we highlight BHLDN again with their slightly silver A-line wedding dress.